Tony Romo and the Cowboys fit the term mediocre perfectly at 7-7. Evel Knievel had a stock answer when asked why he jumped motorcycles over cars, fountains and canyons for a living. "I’m Evel Knievel," said the man who suffered 433 bone fractures. That brings us to the NFL’s leading fourth-quarter daredevil, Tony Romo. The Cowboys are crumbling and the blame game is back on in Dallas. People are blaming the owner, the coach and, of course, the gagging quarterback. In turn, Romo should blame Dallas. Not for saddling him with Jerry Jones or Jason Garrett or history’s worst defense. Romo should blame Dallas for not letting him be accepted as the so-so player he is. So-so means somewhere between terrible and great. After jumping between both ends of that spectrum for eight years, it’s apparent Romo’s true landing place is in the middle. He’s dramatically ordinary, and we should expect his team to reflect that. His career record is 62-45 as a starter, but the past four seasons he is 24-28. 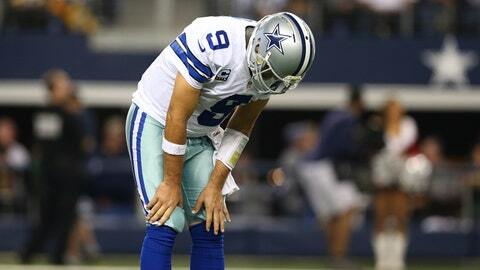 For all the thrills Romo provided, he has one more playoff win than Tony Roma. Sunday was a microcosm of his unique ordinary nature. An afternoon of fine QB work against Green Bay was obliterated by two interceptions in the final three minutes. The 37-36 loss was enough to make semi-grown men like Dez Bryant cry. As always, it wasn’t all Romo’s fault. As always, that doesn’t matter when you quarterback America’s Team. To quote Waylon and Willie, mammas don’t let your babies grow up to be Cowboy quarterbacks. It’s the country’s most inflated and scrutinized job outside of 1600 Pennsylvania Avenue. If you succeed, you’ll go down in history. If you fail, you’ll make the Drudge Report faster than any other player in the NFL. Romo knows the drill. It became obvious in 2007 when a quick getaway to Cabo San Lucas with Jessica Simpson became worldwide news. If he didn’t want the paparazzi element that comes with the job, he wouldn’t, he shouldn’t have signed that six-year, $108-million contract before the season. There’s no reason to feel sorry for the guy. But you’d understand why he might have tempted to pick up the phone this week and call Matt Ryan. "Hey, Matty," Romo would say. "Want to trade places for week?" Like Romo, Ryan became a $100-million quarterback before the season. Like Dallas, the Falcons entered the year with great expectations. The Cowboys are a disappointing 7-7, but Atlanta is a disheartening 4-10. Ryan’s stats are comparable to Romo’s. So is his reputation as a quarterback who can’t win big games. If the Falcons were in Dallas, their slide would be a sports-talk staple. Ex-quarterbacks everywhere would be assigned to analyze Ryan’s footwork on third down and predict how it might translate to a snowy Super Bowl. If a tree throws interceptions in the Atlanta woods and nobody sees it, does it make a sound? Answer: It’s the Falcons. Who really cares? The thing is, the Falcons’ quarterback is better than Romo. So are the quarterbacks in about a dozen other cities. Most polls would place Romo borderline on the top third of NFL signal-callers. But people are still dismayed when Romo can’t pull off a Drew Brees imitation in December or January. For sure, he’s had a great career for a guy nobody drafted out of Eastern Illinois. His defenders can trot out all sorts of glowing stats. Romo’s career QB rating is 95.6, the sixth-best in NFL history. Of course, modern-day passing has rendered that stat bogus. Six of the top seven quarterbacks in history are currently playing. Romo’s rating is 12 points better than Roger Staubach’s. It’s 14 better than Troy Aikman’s. Who would Dallas fans prefer as their quarterback? Just when Romo might be swaying a few opinions, he’ll do what he did Sunday. Miles Austin had a step on his defender, but Romo’s pass was a step too late. "You get that thing up in the air, a little more loop on it," Jones said on his radio show Tuesday, "Miles is still running." And if Romo were Staubach, every day would be Christmas. It’s fair to criticize him for all those fourth-quarter glitches. What isn’t fair is to think he should be Aikman or Captain Comeback Staubach. Romo is a lot closer to Danny White or Craig Morton. They had respectable careers, but you wouldn’t remember them from Mike Phipps if they hadn’t played for Dallas. Romo’s days are far from over, but we would save ourselves a lot of shock over the next few years if we’d just accept him for who he is.